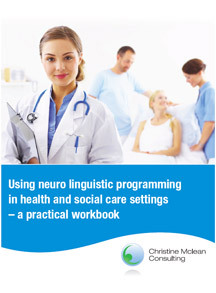 Resources: Download the eBook "How to improve communication in health and social care using NLP techniques"
Before downloading the FREE eBook "How to improve communication in health and social care using NLP techniques", please take a minute to complete the following form. I just wanted to say a personal thank you for your lecture last week on Change and transition and the main topic of resilience. I really though that your message hit home with me and off all the many lectures I have had, yours was by far the one I found most helpful and useful. The BEST. I loved it, thanks for your passion and enthusiasm, I'm inspired.